Where Are Diesel Prices Headed? A recent farmdoc daily article (August 28, 2015) examined the relationship between Brent crude oil prices and U.S. average gasoline prices at the pump. The historical relationship indicated U.S. gasoline prices should be about $2.00 per gallon, but remained stubbornly above $2.60 per gallon. It was argued that the gap between predicted and actual gasoline prices could be traced to the improving U.S. economy and sharply lower crude oil prices, which, in combination, have spurred gasoline demand and pushed the production capacity of the U.S. refining industry to the limit. The purpose of today’s article is to extend the analysis to U.S. pump diesel prices. We begin by examining the relationship between crude oil prices and retail (pump) diesel prices in the U.S. 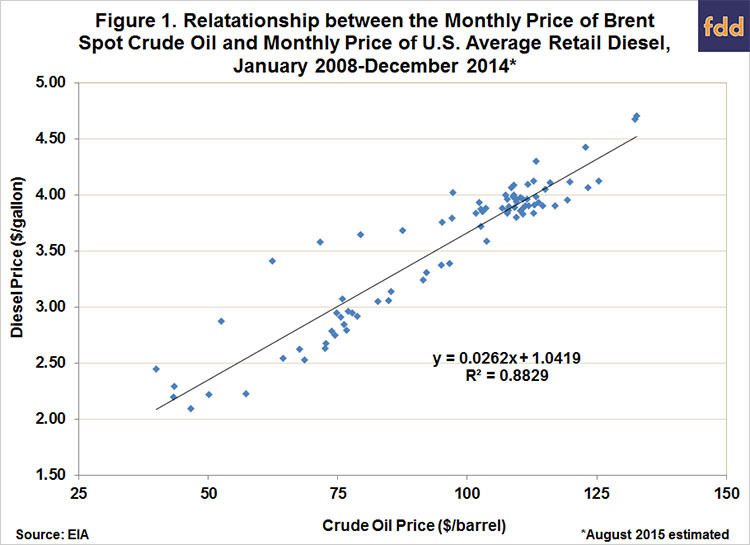 Figure 1 shows a scatter plot of monthly spot prices for Brent crude oil and monthly U.S. average prices for retail (ultra low sulfur) diesel over January 2008-December 2014. Brent crude oil prices are considered because Brent prices have predicted U.S. gasoline prices better than WTI prices in recent years, as pointed out by Jim Hamilton (May 16, 2012, June 24, 2012; June 21, 2014) and others. The Brent crude oil price series is collected by the EIA and found here. Diesel prices also are collected by the EIA and can be found here. With an R2 of 0.88, the fit of the relationship is strong but not quite as high as found earlier for gasoline (0.92). The coefficients continue to have a sensible interpretation. Since a barrel of crude oil contains 42 gallons, a logical slope is simply 1/42 or 0.024. The slope estimate in Figure 1, at 0.0262, is close to this predicted value. The intercept, 1.0419, estimates the national average of: i) state and federal gasoline taxes; ii) refinery margins, and iii) transportation and other markup costs. 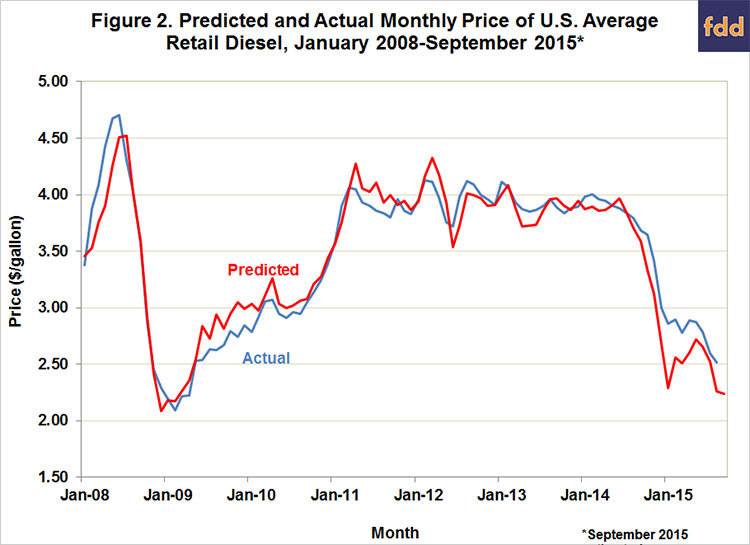 Figure 2 presents predicted and actual U.S. average diesel prices over January 2008 through September 2015. The September 2015 Brent price is estimated based on the average of daily prices through September 21. The September 2015 diesel price is estimated based on the average of the first three weekly prices in September. The predicted values are computed using the regression coefficients presented in Figure 1. For example, the January 2011 Brent crude price was $96.52 per barrel. The regression relationship predicts a U.S. average diesel price of $3.57 per gallon (1.0419 + 0.0262 X 96.52), which compares to the actual monthly average diesel price of $3.39 per gallon in January 2011 Note that the regression model was estimated over January 2008 – December 2014. This means that the predicted diesel prices for January – September 2015 are truly “out-of-sample.” Similar to gasoline, what is striking in Figure 2 is how much the regression model has underestimated diesel prices to date in 2015. On average, the predicted prices have undershot actual diesel prices by $0.31 per gallon. The magnitude of the undershooting has declined during 2015, with the predicted model price for September $0.28 per gallon less than the estimated actual price. With Brent crude oil prices currently trading near $45 per barrel, the historical relationship between crude oil and diesel prices indicates that the U.S. average “pump” price of diesel should be about $2.25 per gallon. Instead, diesel prices seem are stuck at about $2.50. Like gasoline (farmdoc daily, August 28, 2015), the biggest factor in explaining the $0.25 gap between predicted and actual diesel prices is the production capacity of the U.S. refining industry, which has been pushed to the limit by rapidly growing gasoline and diesel demand. For example, the U.S. Department of Transportation reported that miles driven in the U.S. was a record 283.7 billion miles in July 2015, the highest ever for that month and up 4.2 percent year-over-year. Diesel prices are likely to remain at a premium to crude oil prices until the squeeze on refining capacity is eased. Irwin, S. "Where Are Gasoline Prices Headed?" farmdoc daily (5):158, Department of Agricultural and Consumer Economics, University of Illinois at Urbana-Champaign, August 28, 2015. Why Isn’t the Price of Ethanol RINs Plummeting?